Coatings, plastics and roofing materials may soon feature a brilliant blue pigment with heat-reflecting characteristics. Discovered serendipitously by Oregon State University chemists in 2009, the blue pigment is set to reach the marketplace later this year. The university has signed an exclusive licensing agreement with The Shepherd Color Company, of Ohio, for the pigment known as “YInMn” blue. 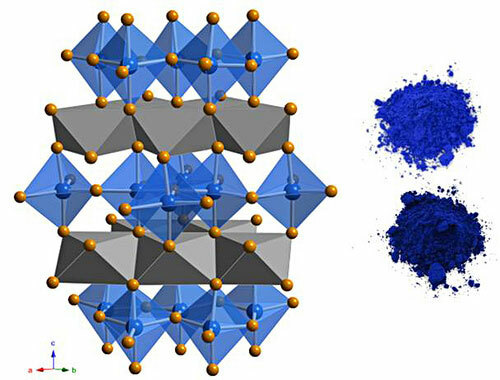 OSU chemists discovered a new type of durable, environmentally benign "cool blue" pigment that has been found to possess heat-reflecting characteristics, offering the potential for reduced energy use in buildings. Commercial quantities of the blue pigment will be available later this year. The commercial development has solved a quest to develop “a near-perfect blue pigment” that began thousands of years ago and captured the imagination of ancient Egyptians, the Han dynasty in China, Mayan cultures and others, according to the researchers. “This new blue pigment is a sign that there are new pigments to be discovered in the inorganic pigments family,” said Geoffrey T. Peake, research and development manager for The Shepherd Color Company. OSU chemist Mas Subramanian and his team were experimenting with new materials that could be used in electronics applications when they mixed manganese oxide—which is black in color—with other chemicals and heated them in a furnace to nearly 2,000 degrees Fahrenheit. One of their samples turned out to be a vivid blue, the university reported. “It was serendipity, actually; a happy, accidental discovery,” Subramanian said. The new compound is formed by a unique crystal structure that allows the manganese ions to absorb red and green wavelengths of light, while only reflecting blue. The unusual “trigonal bipyramidal” crystalline structure seen here is being used by researchers at Oregon State University to create a range of new pigments that could have significant applications in the paint and pigment industries. “The basic crystal structure we’re using for these pigments was known before, but no one had ever considered using it for any commercial purpose, including pigments,” Subramanian said. The vibrant blue is so durable, and its compounds are so stable—even in oil and water—that the color does not fade, the researchers stated. Further, none of the pigment’s ingredients are toxic. These characteristics make the new pigment versatile for a plethora of commercial products, such as coatings and plastics. Used in paints, for example, the pigment could help keep buildings cool by reflecting infrared light, the researchers noted. Another possible commercial use of the product may be in roofing materials. The new pigment is a “cool blue” compound that has infrared reflectivity of about 40 percent, much high than other blue pigment, the researchers said. “The more we discover about the pigment, the more interesting it gets,” said Subramanian, who is the Milton Harris Professor of Materials Science in the OSU College of Science. “Who knows what we may find?” he said. Commercial quantities of the blue pigment will be available later this year, according to Shepherd Color.